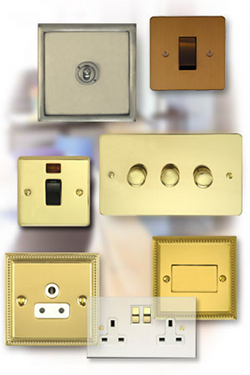 Are you looking for Focus SB switches and sockets? All our plates are cast and finished by hand by the British craftsmen at our manufacturer Focus SB in Sussex. They are not cast abroad and finished here as some inferior makes which claim to be "Made in Britain" are. We use an "electrophoretic" lacquer unique to Focus SB. This unique type of lacquer prevents tarnish and neither scratches off nor has the "plastic touch" of a conventional lacquer. Every order is made to order. Your order takes 7-14 days to be manufactured. You can have WHATEVER you want. This site hosts our standard range but we can also make anything you want and include design details like engravings, coloured lettering or motifs.